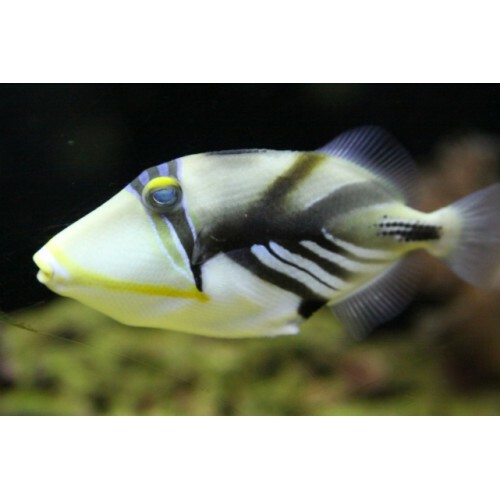 The Niger Trigger or Redtooth Trigger is a striking fish for the home aquarium. The exact colour of the Niger Triggerfish varies in this species of fish, and can also change from day to day between purple, blue and blue/green with a striking, lighter blue highlight on the fins and long tail lobes. The colour temperature of the lighting also plays a role in the coloration of any fish in the home aquarium. As an adult, they acquire bright red teeth, and are normally dark purple in colour with a blue/green highlight around their face making them quite interesting to watch when they eat.